The Olympus Stylus 1 combines a fantastic feature set with excellent image quality and performance to create a compact camera that you will have to get your hands on. Although you may want to put it back down after seeing the $700 dollar price tag. Read more in our Full Conclusion. During the fall of 2013, Olympus announced their new STYLUS 1; an "enthusiast" compact camera designed for semi-pros who need an all-in-one with manual controls and a quality lens. The STYLUS 1 boasts a newly developed, ultra-slim 10.7x i.ZUIKO zoom lens with a constant f2.8 aperture, built-in VCM image stabilization, Macro Shot capabilities as close as 2-inches, and a 28-300mm 35mm equivalency. In addition to quality glass, Olympus gives the new STYLUS 1 a 12.0-megapixel 1/1.7-inch high-sensitivity backlit CMOS sensor and same TruePic VI image processor used in the Olympus OM-D E-M5. Together, this sensor and processor should be fast and and accurate, even in lower lighting conditions. The SYTLUS 1 not only shoots Full HD 1080p video, but also has two Slow Motion modes capable of recording 120 and 240 frames-per-second. A Hybrid Control Ring, similar to the XZ-2 iHS, is at the heart of the 1's manual operation. Basically, the control ring can -- in digital mode -- handles fine zooming and manual focus; or -- in analog mode -- users can adjust aperture, shutter speed, and other settings. There are also two customizable Function buttons, a built-in flash, a side zoom lever with variable speeds, and a hot shot for optional accessories. Like most 2013 cameras, the STYLUS 1 includes built-in Wi-Fi. Users should first download the free Olympus Image Share 2.1 app for smartphones. Then, it's easy to sync the phone to the camera by scanning the QR code on the camera's LCD. This allows users to wirelessly adjust camera settings, depress the shutter, operate in Live Bulb mode, or simply use the smartphone as an external Live View display. Pretty cool stuff. 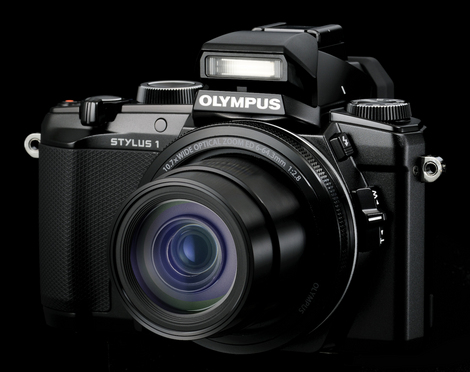 The Olympus STYLUS 1 is available now with a $699.99 MSRP. Click on our buy button to see the most current online pricing.